WHEN you pause to consider the sheer size of Geoff and Rebecca Willett's Maydan Feedlot at Bony Mountain it's hard to believe that prior to 1984 it was vacant scrub. It was 30-odd years ago while the couple were running the former BP Maryvale on the Cunningham Hwy north-east of Warwick that they decided - in Geoff's words - to "have a bash" at farming and the rest, as they say, is history. As one of the local pioneers of the grain-feeding of cattle, an industry born out of necessity in time of drought, Geoff Willett today oversees a beef production operation feeding up to 10,000 head of cattle at any given time. The Maydan name is perhaps most widely associated with EU accreditation and Japanese Wagyu beef - breeding its own stock - but the feedlot also specialises in the long-term feeding and fattening of other people's cattle, with around 50 regular customers with their own particular requirements. The feedlot itself sits on 24ha of a 480ha property, with half of that irrigated Condamine River flats and the other half dryland cultivation and grazing. The other numbers on Maydan are hard to get your head around, but give it a try. With the feedlot at capacity, we're talking an average monthly feed bill of $1.1million, with each hungry Wagyu beast consuming between $1500 to $1700 worth of highly customised grain mixtures alone over a period of between 450 to 600 days, depending on breed and age. This equates to 14,000 to 15,000 tonnes of grain a year, mixed in with about 25,000 tonnes of hay and various other supplements which are carefully factored in. 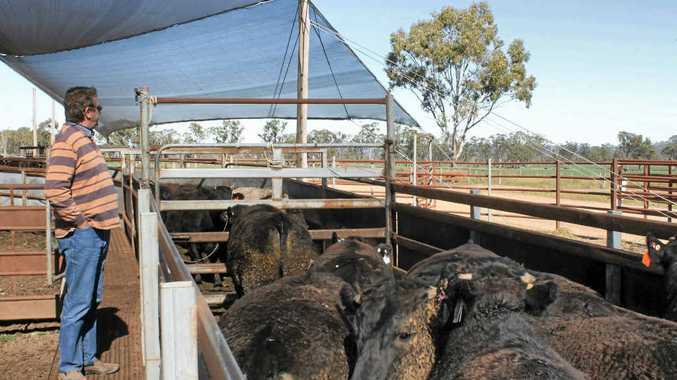 Water is drawn from two bores on the property and from the Condamine River into an array of storage tanks, and is pushed around the feedlot pens by a bank of pumping stations with sensors and plenty of backup in case of a breakdown. Cattle in the feedlot can drink up to a staggering 350,000 litres of water every day while they lazily work on the end result, namely a memorable steak experience savoured by diners both domestically and internationally. A visit to Maydan Feedlot and a guided tour by Geoff is as much as anything good exercise, both physically and mentally. He walks quickly and talks just as fast, and you have to work to keep up with this hands-on operator who knows his operation inside and out, and rattles off facts and figures rapid-fire. Geoff explains that induction at Maydan, if you're one of the guests, involves a lot more than getting off a truck and finding your way to a feed trough. Each beast is carefully assessed on arrival, with a fully integrated computer system recording details of breed, weight, age, gender and other characteristics, which are routinely updated over the course of the feedlot stay to keep a close eye on progress and costs. Also recorded is their lifetime - and post-lifetime - traceable National Livestock Identification Scheme (NLIS) data, via ear-tag. As Geoff puts it, they record each and every animal's "full life history". Over at the pens he points to the shade cloth overhead, saying the welfare "of every animal is our number one priority". "We have five shade systems here. We did a lot of R&D (research and development) with Netpro, who do the fruit orchard shade cloth at Stanthorpe," Geoff says. "We thought if they can cover orchards they can cover cattle. "The shade systems are designed primarily around summer temperatures and are angled in such a way that the hot air escapes. "It's a world-first design and it's now being copied internationally. But just as important to animal welfare is the dedication and commitment of our staff." One of Maydan's major by-products is, naturally, what comes out "the other end". Manure is processed and stockpiled in a standalone operation, impressive in itself. "We compost the manure for up to two years and we screen it two or three times," Geoff explains. "We screen it down to 10mm, like topsoil. "The vast majority of manure goes to farms in Warwick and Stanthorpe and across the Downs, with some of the product used on sporting fields in the region. Geoff becomes most animated when talking about his Wagyu breeders, pointing to a paddock of bulls with "100 per cent Japanese genetics". Other paddocks are lush with winter oats - liverseed in summertime - on which some of last year's heifers are happily munching, before being run with the aforesaid bulls in the spring. "We run 400 breeders of our own on five leased properties, locally and in New South Wales," he says. "With progeny we have between 1600 and 1700 Wagyu cattle at any given time." When it comes time for cattle fed at Maydan to proceed one step closer to the plate, a fleet of Maydan trucks and road trains takes them to processing plants across southern Queensland and NSW. After 30 years of operation Maydan is at capacity and is likely to maintain its current operating level, with Geoff these days also involved in other business pursuits. "The reality is an operation of this size in this location would probably not get an approval today," he says. "So the ability for us to expand isn't there, but we will keep on doing what we are doing."